The best news of all: my first-year mammogram showed that I am cancer free. Wonderful! I actually found out last week. It’s a slow, and therefore strange, kind of relief—as if I had been holding my breath ever since my diagnosis one year ago and I’m still not sure it is really OK to breathe. The fear that a cancer diagnosis generates is, I now understand, akin to the skin darkening that comes with radiation treatment: it fades slowly over time and may never completely go away. My response is to live my life. I don’t have any other option, but how I live now feels like a choice. What do I want to do? The first big choice I made was to return to clinical nursing. In July I started back at my old job as a per diem nurse in home hospice. I usually work two days/week and it has been great to be back with my old team. I work with the most fabulous nurses, and our patients are wonderful, even when they drive me crazy. There’s nothing quite so humbling as spending time with people who know their death, or the death of someone they love, is more or less imminent. In our polarized, highly-politicized world, a dose of humility is always good. The second choice I made was to write a book about having cancer. It’s not a memoir of my disease per se, but an exploration of what it was like to be an oncology and hospice nurse and then become a cancer patient. Over this past year I learned how little I, the nurse, actually understood about what cancer patients go through emotionally and physically. I learned how terrifying the word cancer is when applied to oneself. I learned the power of honest explanations, the importance of always telling patients the full truth about the effects of treatment. So, I’m going to be working on that book, which is still coming together as a proposal, and not writing more on this blog. Some might say that ending on post number 13 is bad luck, but after cancer my notion of superstition has been upended. There’s good luck and bad, and each of us hopes for more of the former than the latter, but often we have no control over either. We are, none of us, ever just the sum of our luck, but cancer makes it hard to believe that. Every time I see my internist he says, “Stay healthy.” Yes, I’ll try. And meanwhile, I’ll be writing. Posted on September 19, 2018 by Elliott Mower. Normal. My college friends and I, imagining ourselves as decidedly worldly, often declared that “nice is not enough,” meaning that people needed to be interesting, edgy, neurotic even to really be worth knowing. Believing that normal is overrated would probably be the updated analog. Who wants to be normal in a culture that prizes speaking up and standing out? Well, um, me. Having cancer has made normal intoxicating, rare, special. Normal means I spend my weekend planning bike rides and putting off yard work instead of thinking about cancer. Normal means I talk to the kids all the time, but not about my cancer. Normal means I’m not in pain from surgery, rashy from radiation, or feeling turned inside out because Tamoxifen. Normal means life without cancer. Of course the cancer hasn’t completely left my mind—I take Tamoxifen every day so I can’t say that I’m done with cancer or cancer treatment. And I will have my follow-up mammogram in August, a follow-up appointment with the surgeon (actually, his PA) in October, and a follow-up appointment with the medical oncologist in November. But why think about any of that until the dates arrive? If my cancer diagnosis taught me anything worthwhile, it would probably be that I now truly understand that worry does absolutely no good. Life happens despite our anticipations, hedges, or attempts to bargain for something better, because that’s normal, too—the unexpected. The cancer diagnosis was unexpected. How could it be otherwise? But then cancer became normal, or at least took the place of so much of my normal life that I then had to find a way back to my true normal. And right now I’m at the beginning of that effort. I feel the texture of normal in my life, which is to say I feel the absence of the fear of cancer. To be in the present and not be afraid—I think that that’s where normal starts. I finished radiation on December 23, started Tamoxifen, the estrogen-receptor blocker that I will take for five years, on January 1, and now we arrive at January 31. Fatigue from the radiation came on right around Christmas. It’s…odd how some radiation oncologists say there is no physiological reason for the fatigue. My own rad. onc. Doc said that, but then also said there is a theory that the fatigue from radiation comes from cytokine release. And if you google “radiation fatigue cytokines” several articles come up that theorize a link between radiation treatments and release of cytokines and fatigue. FYI: Cytokines are small proteins used for cell signaling and are part of the body’s immune response. Why are women told there is no reason for them to be tired, when the experience of fatigue following radiation seems to be close to universal? That’s just part of the cancer puzzle I’m in the middle of figuring out. Basically, I’m asking myself, what did this experience mean to me? And then I feel that calling cancer an “experience” is already at one remove from the reality of it. Trying to understand, I find myself returning to Antoine de Saint Exupéry’s lovely children’s book The Little Prince. The page below is my favorite part of the entire book. The narrator, having just learned about boa constrictors and their unusual eating habits (consume animals whole; digest at leisure), draws a boa constrictor that has eaten an elephant. 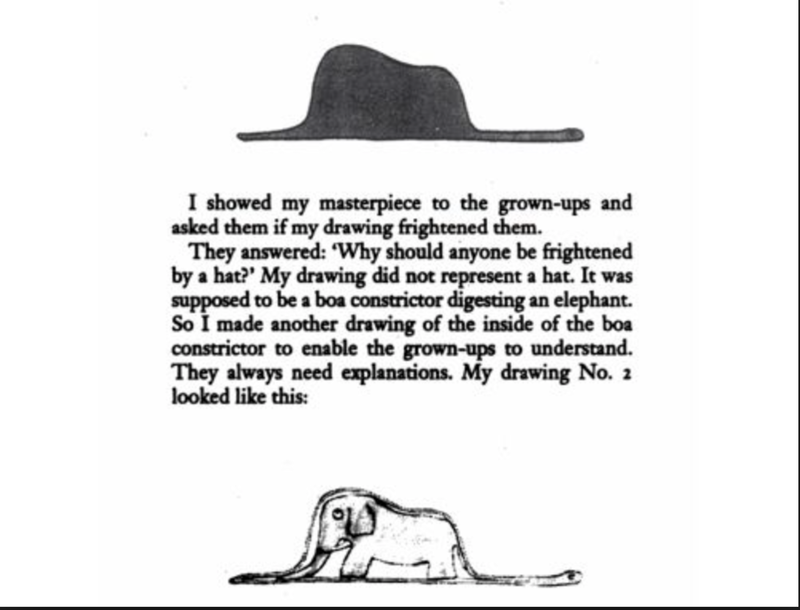 He shows it to “the grown-ups” and they misidentify the drawing as a hat. Then he draws another picture in which the boa constrictor is transparent, making the elephant clearly visible inside. The grown-ups still don’t get it. I’m stuck because attempting to understand the experience of cancer feels like a boa constrictor slowly digesting an elephant. But part of me wants to think the whole thing is only a hat. It’s the cancer hat, sure, but you put it on for awhile and then take it off: cancer leads to treatment—et voilà, no more cancer, and then I get to take off the hat. In the back of my mind, though, I’m pretty sure that having cancer is not like wearing a hat. I’m pretty sure I will be digesting this experience for a long time. I’m pretty sure that having cancer is very much like swallowing an elephant. Posted on January 31, 2018 by admin.